Shall touch on nations in troubled waters to let readers have some information. I do not pride myself as a macro guy but this data is pretty insightful, it took me a while to get the table done but was well worth the effort. I will not be liable for any reliance on the information to make investment/s. decisions. Click HERE if you are new to ratings, very good explanation by Blaha Finance. Comes back to the point in my 1st post that a troubled country like Greece should not have sovereign yields for its debt. Previous news on traders scalping yield for 10 year Greek debt of 7+% to 6.5% was out of this world. True enough, now its over 10+%, 2 year at 15%. Well, you do not need a rating agency to tell you that Greek debt is junk status. It will and should stay at these yields or higher. Looking at the table, I was very surprised to see Japan being the next largest reserve holder after China, mainly from strengthening of Euro against dollar. I guess we will see that reversing soon. I highlighted in bold potential debt default candidates. Reading news and all do not give a clear view of the amount of risks lies therein the sovereign debt until you assemble the numbers. The European countries in bold look awfully bad especially Ireland. Now US does not seem so bad relatively aint it?. Theres always a price to pay for something. Click on the picture above to enlarge and see the otherwise invisible GDP growth yoy. Now the main bulk of the problem is Euro nations hold the debt of each and other. So if one falters, there is a strong incentive or rather disincentive to all rush and support that nation. So increasingly we can see the stress lines from Greece and now from Portugal and now likely Spain. 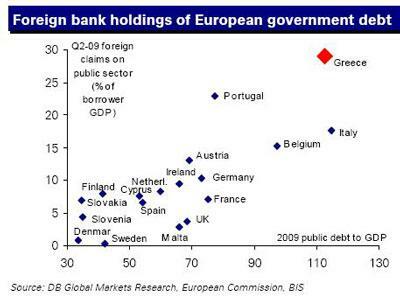 Foreign banks are holding alot of Greece and Portugal debt and less of Spain. 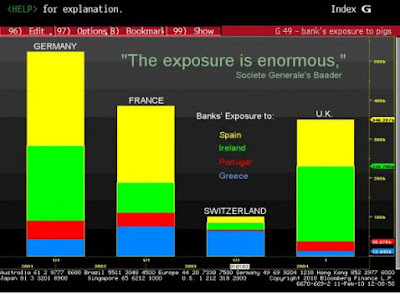 However Euro banks are holding alot more Spain and Ireland debt. However, countries in immediate distress are those with high government debt to GDP and with poor GDP growth figures, not total debt to GDP. Spain is in trouble as it has over Eur 225 bn worth of debt due in 2010 (lumpy debt maturity), equivalent to Greece's economy. Adding to the problem, Spain has the highest budget and current account deficit in the world second to Iceland. However, noting its low debt relative to other troubled nations, its problem will be a slow one to come up and a likely economic recovery may save it from a fate like Greece. With the risk aversion and likelihood of cross default among Euro nations, we see a across the board decline in the stock indices. Please also note short US and/or Euro is a long term view. In the short term, both may rise in view of the falling markets due to unwinding from risk aversion trades. Do not ignore this development as US / Eur has one of the largest money supply around and unwinding may prove to be painful to those who short the USD or Eur early. Looking at the current down market, I thought it would be apt to move into this counter, a deeply undervalued counter. A Brief - Roxy Pacific (RPH) is a small-mid scale Singapore property developer with some investments in commercial property, mainly in the East Coast, District 15 area. Substantial discount to RNAV (the freehold hotel value is carried at cost). Even if assuming the developments are worth zilch, 0.8x price to NAV with only the revalued hotel will give a value of S$0.378 and 1x gives S$0.473. This week, research was done but was not able to hit any trigger. Many of the counters on my buy list keep going up, obviously a nitro- charged bull acting. I find it hard to buy when everyone else is, somehow the price action seems to prove otherwise. The sovereign risks, China's property rush, impending corporate debt problems and a high likelihood of rising interest rate lingers in the backdrop, risks that are too glaring to ignore. Perhaps I should buy in post dividends season or at least start preparing my shorts. It seems like an overwhelming large majority of Asian companies have exceeded their fair value. Recently wanted to write on this as I am close to done on my research on stocks to buy while the markets continue to range trade and hopefully fall. Most importantly, I have decided to buy some of the most scorned of companies on the exchange, namely S chips listed on SGX. Honestly, I think some of them are punished far too much versus other counters. Reading an recent article from JP Morgan in 2008 on red flags, I felt it would be good to let readers know more about spotting dubious firms. Here are the factors that the report stated. I presume this report was from their Asset management arm. Good list here which I believe is sufficient to analysis on top of reading the footnotes carefully! On the side notes, I have been recently reading alot on managers saying Singapore is a dead pool while considering dual listings which give rise to higher valuations. Therefore, overseas analysts and investors understand and appreciate their business unlike Singapore analysts and investors who do not know anything. We shall see how the overseas markets will "better understand" with the performance in future. March was a pretty flat week with little happenings and April looks set to beat March on that. After the market rallying for a few weeks in a row, today it is taking a break. I cannot and do not market time as my track record is embarrassing and I do not wish to catch a falling knife. I will still continue to buy things on a cheap, albeit at a slower pace. I do not think the property frenzy will end. Why? Do you think yields and down payment matters to residents? USD 41 bil by Euro counterparts, 3 year loan at 5%,wow! Country can issue own currency and is accepted in global commerce? 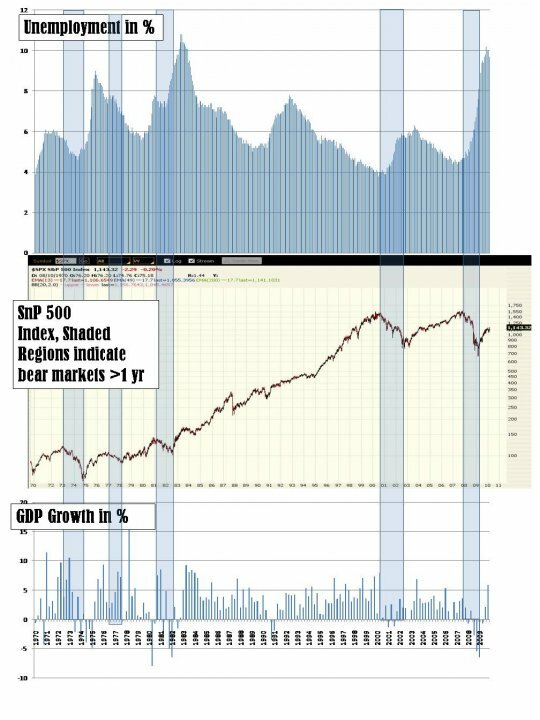 Initial conditions moderate (Debt, deficits, demographics and growth)? Can it issue future public debt as a substitute for private credit? Central bank can reflate via low/negative rates without creating a currency crisis? est. US 46 tril (4x out.debt currently) of unfunded social medicare insurance. We are in for one big ride! By ensuring one buys good quality business with favorable pricing power, one is essentially hedging against inflation. That will be my guiding principle for 2010. I received some well wishes and comments from some of you and will post my replies here. Thank you and happy investing! I was looking at this counter at the release of its 4Q09 financials yesterday (12 April 2010). HK's leading free newspaper publisher for Headline Daily (circulation 760k / day), The standard (circulation 200k / day) and Sing Tao Daily. This versus competitors for free newspapers AM 370 and Metro circulation of approx 200k+/day each. Also publishes several popular HK magazines including East week, PC Market, East Touch, JET, Spiral, CAZ buyer and Job market. The market actions seem to suggest that the market knew something I did not know. Anyone has comments please feel free to write it here. Alright, I know the title sounds cheesy but hey, it provides some simple and good things to watch out for. Your stock should display the following according to the website HERE. As investors, we need to understand what is our aim in managing investments. A clear and meaningful categorization of possible situations allows for better cash allocation as well as active risk management. I know many have read articles from the 2 investors, please bear with me, it is for the benefit of everyone. Overall #4 would have generated some good and some disasters, overall I believe for a small capital, staying 100% vested is important and still result in positive returns versus a benchmark.In times of high valuations, it is hard to find #3, while #1 and #2 historically is hard to find and onerous to manage. Some of my close friends not in the investment field asked me how to survive with a small capital. My answer was precisely when you have a small capital base, it is far easier to produce out-sized returns which I will explain in a later post. Corporate - Firms doing LBOs - $430 b in 2007 with ev/ebitda of 6-9x being common. Such firms will need to recap in 2010 and years to come. 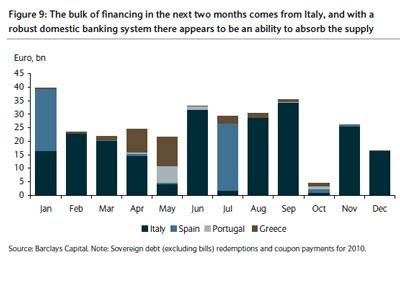 Maturities will come in 2012 and mostly 2013-14. Real estate - The bubbly view on assets also hit properties. It did not help that residential mortgages increased dramatically from US2.3 to 3..3 tr in 2004-07 (13% cagr). Securitization market grew US400 to 800b (25% cagr) in the same period. This led many to believe the large institutional cash to invest, low rates environment and the insufficient supply outlook was real. Cap rates were compressed from 9 to 4+%. In 2009, only 40% of commercial CMBS issued post 2002 have matured and US900b will come due in the nest 3 years. Most of this will come from savings banks and institutions. On maturity, banks and CMBS trusts will then choose to either foreclose, restructure or roll over. Sovereign - US, UK, Japan and Eurozone have collectively US 25.9 tr in sovereign debt including T bills and directly issued central government debt. Most countries with exception of UK over relied on short to medium term funding and 62% of the debt (US 16 tr)will come due in 2014. This will compete with the LBO and CRE refinancing. Governments can do 3 things, improve GDP, cut outflows or simply inflate their way out. First 2 will mean long recovery, higher taxes, less incentives. 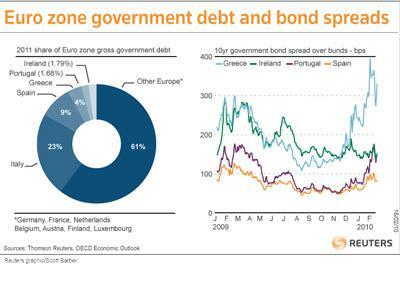 Printing money does not apply to weaker Eurozone nations. Inflation will solve the issue and yet raises rates for future debt issuances, however it will not completely eliminate the debt issue, especially to comply with the Maastricht treaty of 60% debt to GDP levels by 2032. Japan seems to be in quite some situation, I'll see what I can contribute here in the next posts. The early part of the coming decade, we will do fine with low rates and improving confidence and operations across industries. So we can definitely see rising utilization, improving inventory cycles and perhaps even opening debt capital markets. However, in the long run, rates will make a even stronger comeback in a bid to curb inflationary pressures and to avoid a irrational transfer of benefit from the prudent saver to the leveraged consumer. Read a blog on CMBS delinquencies with very convincing numbers. Read it here. I will follow up with some thoughts on out credit driven economy in the next post tomorrow. Something interesting that one of my friend pointed out. The last crisis was one where GDP was hit badly and unemployment rate soared. This chart is from 1970 till now. Do look at the other chart below, market runs inverse to unemployment but 2009 was a anomaly. Either we have too many stock pickers getting better or more people should wake up and get back to work.